Today is the World Read Aloud Day! 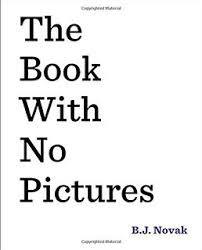 Grade 5 students had fun listening to "The Book With No Pictures" an innovative and wildly funny read-aloud by award-winning humorist/actor B.J. Novak that turns any reader, this time me, the teacher-librarian into a comedian. After that the students read books from the library out loud to friends in small group making discoveries as they were picking the stories to share. "This was the best library time I have had. We did not sit at the tables looking at our iPad" said Regitze (a reluctant reader). I completely agree! I should do that (read aloud) more often with older students. Great fun! Give it a go!